This week, the UK has been experiencing some very warm weather. A few days ago, my friend told me that in London it was 38C. So, naturally, I have managed to get a really nice, even amount of sunburn. Mm-hm, I'm rocking that red lobster look. Other than getting burnt and having a slight existential crisis due to the heat (cries of 'I am British for a reason! I don't do heat!' could be heard as far as Land's End), I have been doing some fun stuff. I have actually been to the beach a fair few times which is fairly unlike me as I am not really one for the beach. I know that sounds insane but I dislike the smell that many British beaches have and I don't like sand. I do like the icecream and wandering along the promenade beside the beach but actually going on the beach isn't something that I really love. I know, I am a miserable sod. Last week, my auntie and I travelled to Exeter for a spot of shopping and I got a lovely shot of the cathedral in the sunshine. We also walked to Westward Ho! and spent a few hours there. I got some lovely Kelly's ice cream there - a scoop of gingerbread and one of coconut chocolate. This is the day that I got the worst sunburn because it looked overcast on heading out so I didn't put on any suncream but it didn't stay overcast for long. I got the vegetarian breakfast from Patisserie Valerie whilst in Exeter which was gorgeous and contained a feta cheese frittata. Yuuum. The view of the garden at my auntie and uncle's house in the late morning sunshine. 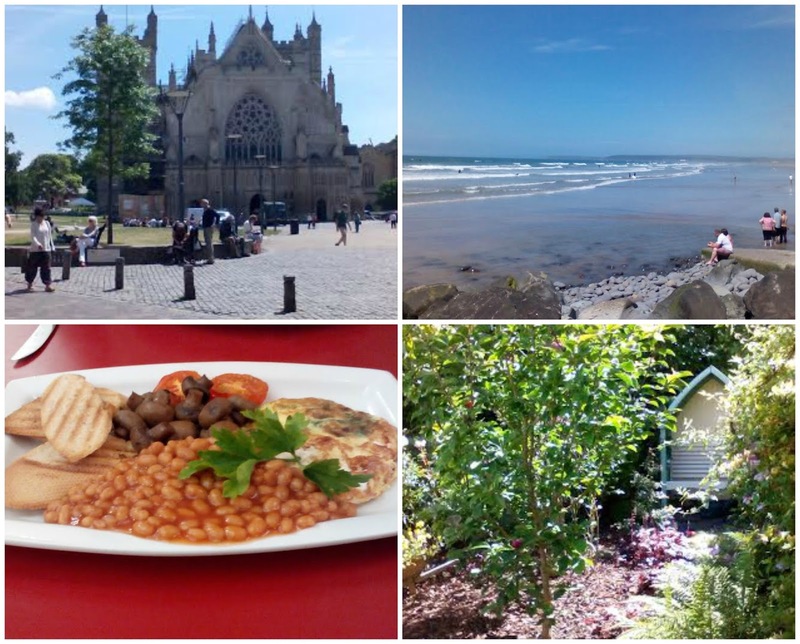 All these pictures are from when my sister and I took the bus to a local town to do a bit of shopping and have lunch out. We found a lovely American imports shop where I bought these pizza flavour Pringles and we also went to a Polish shop where my sister picked up some biscuits that she likes. We then got a BBQ pizza from Domino's (she had never been there and I had been there once when I was a kid). Unfortunately, it was raining - this was a couple of weeks ago - so we had to huddle on a bench under a tree and stuff the pizza in. Surprisingly, we managed the entire pizza between us. 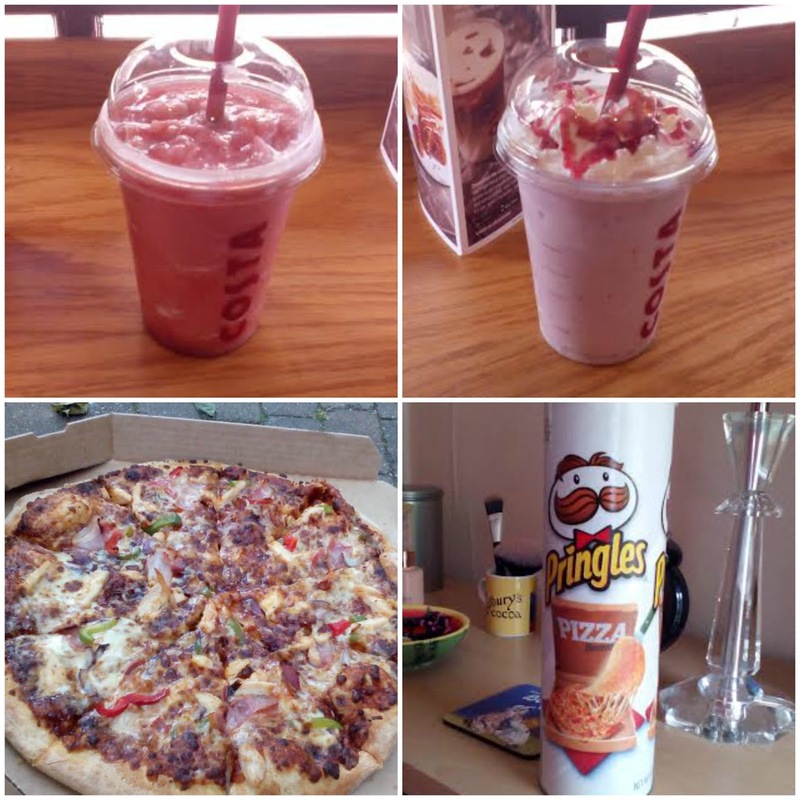 Later, we went to Costa and my sister got a strawberries and cream cooler and I got a watermelon smoothie. On the whole, it was a lovely day out - albeit a calorific one. 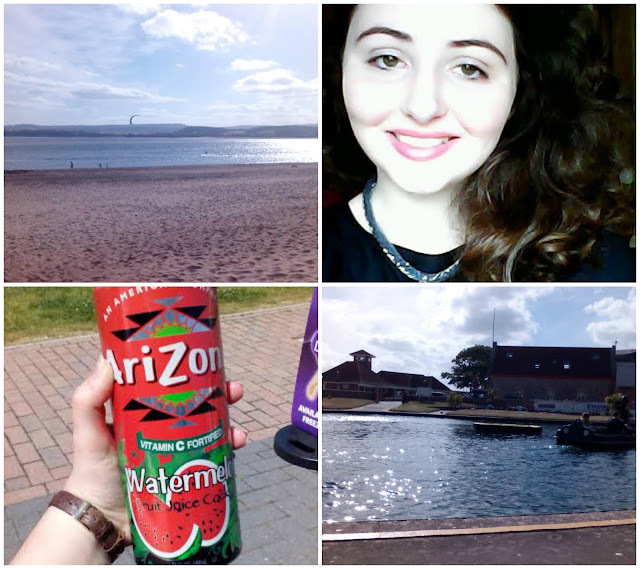 As the weather was nice, we headed out to Exmouth to spend a couple of hours in the late afternoon which was nice. Cheeky selfie. Had filled in my eyebrows and started using my new makeup brushes so was excited to see if it made a difference to my appearance. Finally got a can of Arizona Watermelon Fruit Juice Cocktail. The can was huge but it was really quite nice - very refreshing. Whilst in Exmouth, we went on the pedalo swans which was a lot of fun but also worrying as my brother and sister were in charge of steering and I felt like my life was in their hands. I can't see I've really been a fan of the heat either, I really dislike it! I also now really want a Costa watermelon smoothie, that sounds so good! Good to see you've been making the most of this beautiful weather! It has been hard going though, so humid and uncomfortable! All of the food looks amazing! Beautiful pictures and the smoothies looks amazing!!! Pretty photos! Makes me want to be there! Thanks for sharing.